Evangelicals have always worried about how to be the Church in “the world.” They have also struggled to determine with which institutions to attach themselves. Examining the idea of the church, or ecclesiology, within the Northern Protestant “establishment” in the late-nineteenth and early twentieth centuries, J. Michael Utzinger argues that evangelical ecclesiology was characterized by denominational ambivalence. This ambivalence meant that, while Northern Protestants valued their denominational affiliations, they also had no compunction to work outside of them. Trans-denominational affiliations, a result of this ambivalence, often acted as an agent for change that not only disturbed but revitalized their home denominations. Evangelicals believed their denominations were worth fighting for, even while they criticized their respective denomination’s shortcomings. Faced with what they perceived to be the waning of their cultural influence, different parties of evangelicals in the late-nineteenth worked to change the vision of the church within their home denominations. 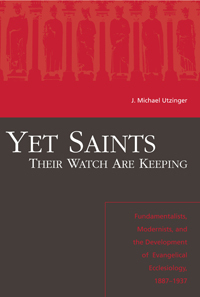 Utzinger examines the theological sources of ecclesiological change (doctrine of the Holy Spirit, eschatology, and methods of cultural engagement) that evangelicals promoted, and how these influenced later fundamentalism and modernism. Further, he carefully charts the dynamics of conflict and compromise within the Northern Protestant establishment churches. Using the Northern Baptist Convention, the Presbyterian Church in the USA, and Disciples of Christ as case studies, Utzinger shows that, despite their infighting, evangelicals typically found ways to cooperate with one another in order to preserve their denominational institutions. In other words, the controversies’ results were not only contention but compromise. And, rather than indicating the eclipse of denominationalism, fundamentalism and modernism acted to revitalize those institutions and help them persist.